Two things occurred last Tuesday. One, the propulsive, kinetic US trailer for Gareth Evans' The Raid 2: Berandal was posted online for general viewing; two, the film itself enjoyed its world premiere in Park City during day six of the 2014 Sundance Film Festival. Two and a half hours and a couple of days later, those lucky enough to be in attendance for the hotly anticipated sequel to 2012's The Raid: Redemption have begun rolling out their reviews for the rest of us to peruse in envy and longing. As if expectations for the film weren't already high enough. Put simply, the early word on The Raid 2: Berandal is good - very, very good, in fact, to the point where even the reviews that fall short of hailing Evan's new action opus as an instant genre masterpiece still can't avoid praising the incredibly talented filmmaker's prowess behind the camera. If The Raid 2: Berandal's international trailer and teaser haven't both ratcheted up fan excitement enough, then advance reactions to it should do the trick. There's something to be said, of course, for managing expectations in the face of hyperbole or otherwise effusive praise. Promos have thus far made the film look like an eye-popping upgrade to the great The Raid: Redemption, an impressive feat to say the least; no one wants to be let down for building up the next installment of Rama's (Iko Uwais) one-man war against Jakarta's criminal element too much in their minds. With its long takes, clear camera work, sublime set design and how-did-the-stuntmen-live? action-scene insanity, “The Raid 2” makes most American action films look like the over-edited stunt-doubled CGI-laden child’s play that they are. And yet, again, better fights can’t make up for a too-familiar and over-long script that lacks the snap, pop and purpose of the first film and skimps on character relationships and plotting so that it might better present a death-and-dismemberment toll comprised of hundreds of faceless minions. Yes, “The Raid 2” brings the noise, but length, repetition and too much space also make it a slightly reduced echo of its predecessor. Naturally this almost three-hour action movie is stacked with fight sequences, each growing more extreme. From beautifully shot fights in a prison yard full of mud to one of the craziest car-chase sequences in recent memory, this film delivers the sort of action that no one else is doing right now. It's just flat-out crazy stuff. The fight scenes are so good, in fact, that you really feel the film slow down when it tries to inch its way through a somewhat convoluted plot. In one specific case, it's not the plot that's too much: it's the level of violence. The Raid: Redemption isn't a bloodless picture by any stretch of the means - throats get cut, arteries get stabbed, heads get shot, and bodies get bludgeoned from top to bottom. It's natural, then, to expect Evans to bring the same graphic, red-streaked sensibility to The Raid 2: Berandal (particularly if we keep his contribution to horror omnibus VHS 2, "Safe Haven", in mind). You might even interpret my reaction as a mark of success for director Gareth Evans and his team of choreographers and makeup artists. The violence in this unrated cut is so relentless, so absolutely brutal, that I just couldn’t take anymore. The snapped bones, shattered skulls and spraying blood walked up to the line of good taste and ripped it apart with the back of a hammer. While athletically and technically impressive, the final fights in ‘The Raid 2′ are so unpleasant that I realized that if I didn’t race out of my seat, I may have vomited in the theater. As before, the giddily over-the-top action attains a hyper-real quality that stays just this side of believable thanks to a combo of sweeping handheld camera moves (by lensers Matt Flannery and Dimas Imam Subhono) and expertly chosen locations that turn Jakarta’s brothels, subways, restaurants, offices and highways into one sprawling, splattery urban playground. If the action choreography (handled by Evans, Uwais and Ruhian) tilts toward the usual tactic of having a bunch of bad guys line up and wait their turn rather than clobbering their opponent all at once — a tactic that works better in close quarters than in wide-open spaces — the stunt work happily remains too consistently, impossibly convincing to dull the pleasure in the moment. And once again, the director (who edited the film with Andi Novianto) proves a dab hand at keeping the action in near-continual motion without sacrificing visual clarity. There are roughly 12-13 action sequences here, and they are all pockets of choreographed brilliance utilizing a variety of fighting styles and implements of death. Like a deadly serious Jackie Chan film, furniture and other handy objects are used here to crush, impale, and destroy opponents. Each fight scene differs and stands apart as its own mini masterpiece. 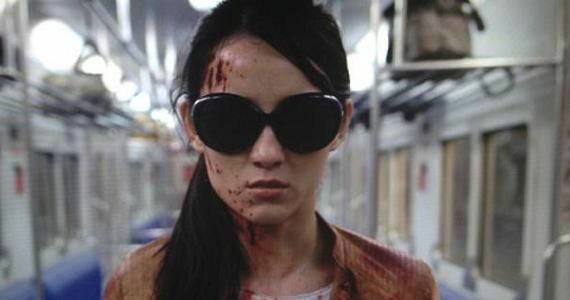 The cell highlights a cramped environment, the subway shows off the gorgeous Hammer Girl’s (Julie Estelle) dual-wielding death blossom, the car chase is a whirlwind of vehicular action and brutal close-quarters fighting in a moving car, and the kitchen… good god the kitchen. Ultimately, The Raid 2: Berandal is a movie that - pleasingly - baffles in its conception and execution; that Evans can make an action movie so dense, thrilling, original and accomplished after only three feature length movies of his own is - like the movie itself - more than a little crazy and exciting. Evans is clearly one of the best action directors working today, but to tack on “action” is slightly dismissive of his immense talent. He treats his action movie like a composer treats music, and as any musician will tell you, the silence between the notes is just as important as the notes themselves. Even when the film is going through the motions of forwarding the plot, the visuals are still lush and vibrant, and the use of sound is phenomenal. Action is Evans’ element, and his technical bravado is abundantly clear in the set pieces, but viewers should also admire what he does outside of the fights. How do you follow an action film as tight and tense and damn near perfect as The Raid? The answer, it seems, is to make a film as broad, intricate and damn near perfect as The Raid: Berandal, aka The Raid 2. Obviously the first point to consider is whether Gareth Huw Evans’s second feature matches up to the bone-crunching mayhem of the first, and it does – with gore to spare. But the second point is more crucial: does it hold up as a stand-alone movie in its own right? The answer to that is a resounding yes too; leaving behind the Carpenter-esque confined spaces of the original, Evans’s sequel heads out into the streets of Jakarta, bringing in so many new and fascinating characters that it’s hardly noticeable when the film’s nominal hero Rama, played by a much more confident Iko Uwais, is absent from the screen (which he is for surprisingly long patches). From the mouths of genre enthusiasts. That last clip in particular will likely get you salivating at the chance to see The Raid 2: Berandal for yourself - it's hard to get better than "perfect" - but general audiences have more than two months to go before the film batters its way into US theaters. In retrospect, it's probably not in anyone's best interest to read any positive word of mouth on The Raid 2: Berandal coming out of Sundance; it's just going to make the wait to March that much more unbearable to endure. But the good news, at least if we take the thumbs-ups at face value, is that the film will be worth it. The Raid 2: Berandal arrives in US theaters on March 28th, 2014.